In nature the one sense that has had the most profound impact on evolutionary success has been the visual sense. Indeed, it has been so successful in the most successful animal of all, the human, that virtually all other senses have reduced to very poor efficiencies indeed and survival reliance has focused almost singularly on the visual sense. But, being human, these remarkable sensors suffer from fatigue and so does the most marvellous of all organisms, our brain, and it can make mistakes or misinterpretations. CCTV cameras have proliferated and have become extremely good, in fact so good that cameras better than the human eye already exists in some respects (thermal and other non-visible wavelength cameras) and soon will reach the magic of human resolution and sensitivity. Nobilis, an advanced image processor, overcomes human frailty and exploits modern cameras’ abilities by using sophisticated techniques to extract information from video streams, thus supplementing human interpretation and overcoming human frailty. Interpreting a scene and extracting information from it requires a HUGE amount of different deductions. One has to detect motion, ignore unnecessary information, memorise paths and predict destinations. In order to do this the human has to identify the object, guestimate its speed and direction and so on. Clearly this is not a simplistic task. NOBILIS offers a unique framework which allows for many different processors all to be plugged in and put to task to answer as many as possible of the various questions required to make an accurate assessment of any situation. Algorithms are provided in individual modules. They are designed to handle multiple video streams but this is affected by resolution, frame rates and are limited by available processing power. Each function is characterised by a processing unit cost which can be used to determine how many algorithms can be loaded on a specific processor and how many sources can be processed. Nobilis has been structured so that, should the need exists, multiple processors can be combined to improve the processing capability. The primary objective of event detection is to detect the event and ensure that the confidence in the detection is not affected by false detection of objects, background changes and movement, and so on. Tools to limit detection areas are provided to assist with this as well as tools to enforce site rules such as no-go areas. Watching over an object is important and tools to determine whether it has disappeared, how long it has been stationary and so on, in an adverse environment, are provided. Once a target has been detected a second task is to understand its behaviour and determine whether it holds a potential threat to the site. To achieve this, tools to determine the object’s path, determine the object’s speed and current direction and its intent are provided. Many sensors have inherent limitations, quirks and special capabilities. Nobilis provides tools that offer specific analysis for thermal, near IR and enhanced images. In addition, it provides tools to handle low quality images sent from mobile devices with very limited bandwidths. Knowing that there is an object is useful, but accurately identifying it is fantastic. Nobilis currently provides tools to read and identify vehicle number plates, human faces and soon will identify other objects, one from the other. Nobilis is able to use a wide variety of input sources, AND, exploit their specific strengths. Thus with thermal cameras as input, factors specific to thermal images can be exploited, with megapixel cameras the high resolution can be exploited, and so on. It is able to deal with low resolution inputs form handheld mobile streamers right up to many megapixel, high resolution devices. In short, it is designed to use any electronic visual source as input. Nobilis is a complete video analysis software suite with a distributable module based architecture. Nobilis modules can be deployed as a network of inter communicating parallel “processors” across several Video Processing Servers or independently on a single server to perform specific and customised analysis tasks. 1. Nobilis-Server: Video processing server foundation for video capture from multiple sources and provides the frame plug-in framework for all Nobilis processing modules. 2. Nobilis-Enhance: Video Enhancement module – Noise Contrast, Edge, Localised Histogram Enhance. 3. 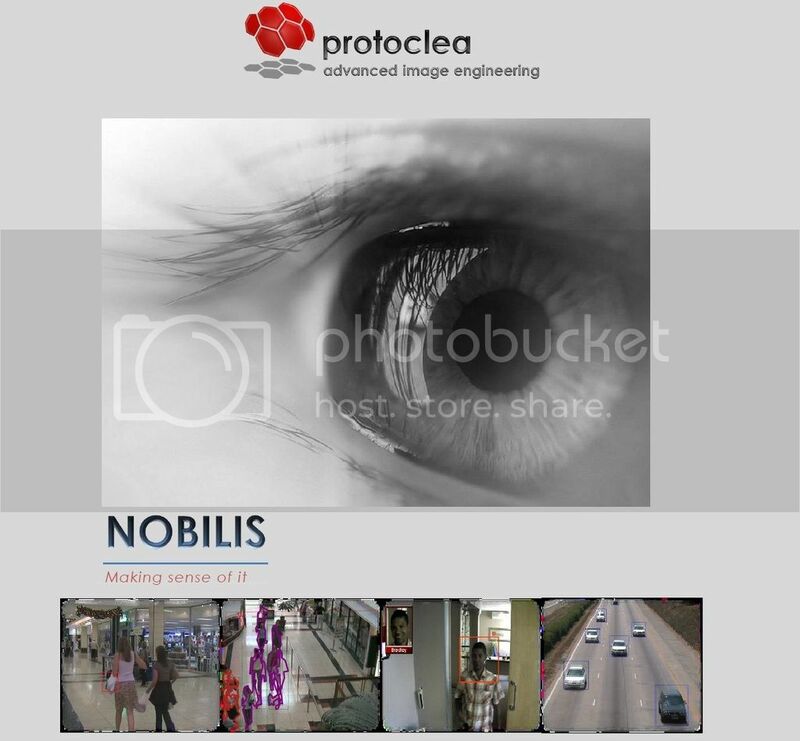 Nobilis-Trespass: Intelligent zoned video motion detection module. 4. Nobilis-Guard: Module to monitor the removal or addition of objects in a busy scene. To download product brochure please fill in the form below.